Nothing currently better illustrates the declining influence and relevance of traditional civil society organisations than the rise and fall of Kids Company. Having once eaten at the top table, even a colour-coded spreadsheet couldn’t help Camilla Batmanghelich scrape together enough crumbs to save the organisation. With the news that government wants to insert a clause into its grants to charities which stipulates that they cannot be used for “activity intended to influence — or attempt to influence — Parliament, government or political parties”, civil society organisations across the UK face a truly existential crisis — do they take the money and tow the line of the elected government, or refuse it and go the way of Camilla and her swimming pool? It is inevitable there will be lot of soul-searching in the coming weeks and months about the symptoms of this policy and the wider malaise hanging over civil society organisations. 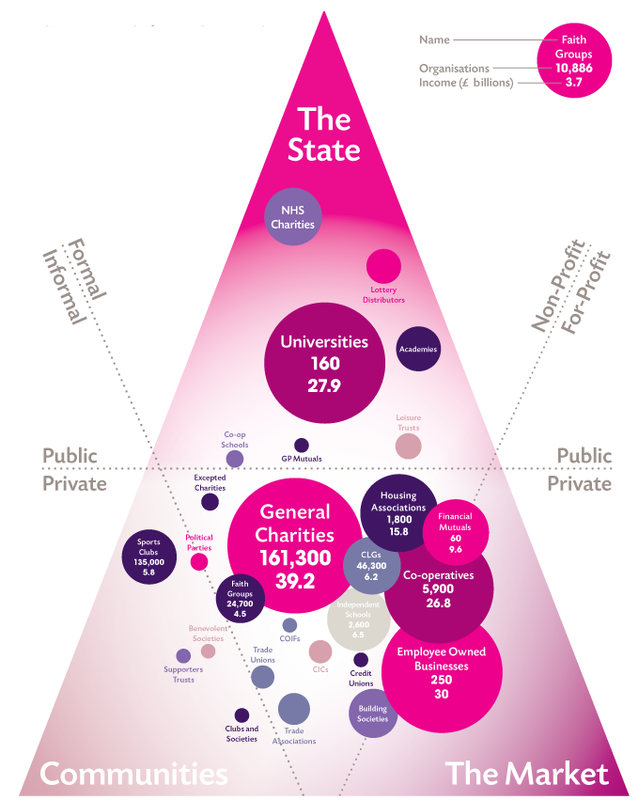 Yet this announcement highlights the imbalance of power between the state and an ‘independent’ civil society, posing an even bigger question than all of the above — are charities and other civil society organisations a relevant force in modern society? What is happening to UK civil society at present — the reforms of its relationship with the State, the constant battering in the media — are symptoms of wider structural changes which have been taking place for over a decade, and which are gathering pace. A shrinking State, a growing private sector, a reframing of what constitutes ‘common sense’. Now what is left of British civil society is slowly being decoupled from the State, but rather than risk a independent sector which could challenge the status quo, vested interests are converging to render it impotent. The Conservatives have long held the view that the relationship between the State and civil society is a ‘zero-sum’ game, with David Cameron arguing back in 2009 that the former had “squeezed out … human kindness, generosity and imagination” from the latter. Basically the expansion of the State into areas historically catered for by civil society organisations had undermined notions of responsibility and self-help, and had contributed to ‘welfare dependency’. As we all know, his vision was to role back the State and enable the ‘Big Society’ to flourish again. Seven years later and we see similar language being used once again to describe the relationship between the State and civil society. The Cabinet Office minister Matthew Hancock argues of charities (part-funded by taxpayers money) lobbying government that “it’s a zero sum game if Peter is robbed to pay Paul.” It seems increasingly that it is much better therefore if the two shake hands and go their separate ways. Or make like Chris and Gwyneth, and undergo a ‘conscious decoupling’. Over time this theory has borne out to be valid. There has and continues to be a strong emphasis on decentralisation (under the auspices of ‘community empowerment’ and devolution), opening up public services to civil society organisations such as charities and social enterprises (not to mention private businesses), and social action (encouraging us to all play a more active role in our communities, particularly young people). These changes have largely been welcomed by civil society organisations. Who wouldn’t want more independence and more opportunities? Under the previous Labour administrations there was a feeling that civil society had increasingly been co-opted by the State, but freeing it from the shackles of bureaucracy in the new age of social media promised a new vibrancy and purpose, with social entrepreneurs and innovators reinvigorating a sector also buoyed by the resurgence of DIY community action and spontaneous social movements. But as we all know, there is no independence to be gained from moving out your parents house if they still dictate what you say, who your friends are, when you have dinner and when you go to bed. Despite the semblance of independence, the sector is being rendered impotent in terms of its ability to effect significant change. This is because the terms of debate on the role and raison d’etre of civil society have long ceased to be self-determined. Over the past few years, I’ve attended many third sector events and read numerous reports where the same old narrative is recycled — ‘resources for civil society organisations are contracting at the same time as demand for their services is increasing’. I am even guilty of recycling this argument myself. Yet this narrative is a reactive one, in which the identity and role of the third sector is determined by ‘the Other’, in this case the programme of austerity. “[There is a] large, taxpayer funded bloc of charities and quangos [which] crowds out privately-funded voluntary organisations which may have very different concerns”. Yet now it seems that in thinking about itself and other organisations like it, the IEA has become one of the “loud voices [that] give the impression of a popular mandate for action that might otherwise lack democratic legitimacy” which it so dislikes. In doing, it and its sympathisers have come to determine the identity of the rest of civil society. This is how hegemony works in the 21st century, when one group is able to assert its version of right and wrong on another. Now we are being told it is ‘common sense’ that the government shouldn’t effectively be paying to lobby itself. Just as it is common sense that unions shouldn’t go on strike in ‘key industries’ or with less than half their members voting. Too many of us (myself included) have accepted these ideas, norms and values of what constitutes a good, civil society imposed on us by ‘others’ (such as the State and the media) primarily because they have appeared to take account of our interests for so long. The State may pay for our salaries and the media may promote our good causes. This enables us to keep doing what we enjoy and change lives at the same time. Where’s the harm? Some would argue that the trajectory of history is governed by the law of the passage of quantitative changes into qualitative changes, and thus attacks on charities with social missions might be seen as the latest symptom of a wider political strategy at reshaping British society to nullify the influence of particular groups. This latest government announcement comes at a time when the Labour Party have stimulated the sort of grassroots community activism characteristic of a ‘spontaneous order’ (whilst trade unions have long been examples of this ideal). Stemming the flow of political energy and funding to your opponents puts you in much better stead for getting what you want in the longer-term. History of course has taught us that such significant changes are difficult to reverse, and alternatives even more difficult to solidify. Yet if we wish to see a fairer, more equitable society, it’s time to better defend civil society organisations and the great work they do. Rather than waiting for others to make the change or tell us what to do, it is up to us to actively change the way we all think about what it is we do. This includes greater self-determination of what civil society is, and what it isn’t. It’s time to speak up in defence of civil society.